Janet Yellen and the Feds raised the interest rates again. After crying the rate hike wolf for nearly a year, she finally raised rates by another quarter point while promising more hikes to come in 2017. Rates weren’t raised sooner because they probably wanted to protect the stock market under Obama. The Fed protects their own because they want globalism and collectivism. That means most Americans get poorer while the central bankers and their elite friends get stupendously richer. Quantitative easing never ended, it simply went underground. 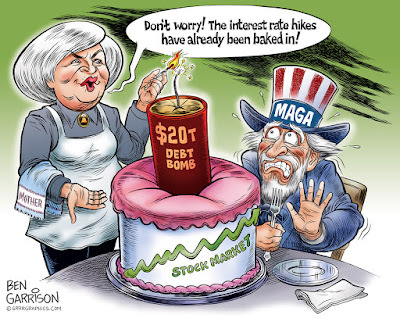 The Fed does as it pleases. There is no accountability—not really. The stock market bubble was pumped up to insane proportions without benefitting citizens who can’t afford stocks. Over 50 percent of Americans are now living paycheck to paycheck. (If they can get a paycheck). The perma-bull market has mostly benefited the global corporations and central bankers who own most of the stock market. The elite prints money for themselves—to hell with lending it out to small businesses and entrepreneurs. Meanwhile, they claim a perpetually rising stock market as ‘proof’ that Obama is doing a great job. Wrong. Mr. 'Hope and Change' helped drive up the debt by nearly 10 trillion dollars while telling everyone the economy was improving and happy days were here again. Obama’s so-called strong economy is based on data distorted by the government itself. It has been based on lies. The employment numbers do not count those who have given up. Too many workers are stuck in low-wage service jobs. The GDP number always comes in high with great hoopla and then it is quietly downgraded. Housing starts are bad. Few can afford a home even with low rates. College grads are burdened with outrageous debt because colleges and banks colluded to get richer. The bankers sell the future in order to immediately pocket their ill-gotten gains, which means young people can’t find work and must move back in with their parents. Real wages haven’t risen in decades. Inflation is apparent at supermarkets. Prices go up while packages get smaller. Regardless, Yellen and those running the show must pretend that everything is A-OK and improving. That means they must prove it by raising rates. To keep the bankers afloat they really should be going to negative interest rates, but they know that would attract the torch and pitchfork crowd. Instead, they are trying to make their ivory tower game of make believe a reality. The problem with this is the debt. Every time the rates are raised, it will make that debt that much more difficult to service. Consider this—if you had $50,000 in credit card debt at a zero percent interest rate, you may be able to manage it. However, rising rates means you must sell things to make the payment. Stocks, for example. Raising interest rates could collapse the stock market. Perhaps this is their real goal—they want to blow things up so they can blame it on Trump. Janet Yellen thinks it’s extremely important to protect the Fed’s “Independence.” Of course she does. They don’t want the scrutiny of an audit. They don’t want to answer to We the People. When Fed chairmen speak to Congress, they use grandiose language to prove how smart they are. They aren’t. They’re con artists. The Federal Reserve was created out of conspiracy, and now those private bankers want to protect their private printing press which not only prints up debt currency out of thin air—it also prints up power. They’re able to buy out politicians and the corporate media. It’s time to end the Fed and return the power of money creation and its management back to Congress as stated in our Constitution.